Last week, Free Day 2013 came to an end. Free Day is a strange beast in the SparkFun menagerie. It started in January 2010 with $100k in free orders in a mad rush. A year later $150k in promo codes went free in an equally mad rush involving customer seniority, quiz questions, and a hefty kick to charity. Some of you may remember January 2012, our third Free Day, as a $200k purgatory of Captchas driven by a Geiger counter. And, yes, it's already over. And their card would not be charged. Their entire order (shipping, tax, and all) was totally covered. It was to run every day starting at midnight Mountain Time and ending immediately after $500 was given away. If $499.99 had been given away and an order totalling exactly $500.00 came through as a winner we'd see our theoretically biggest day at $999.99. Originally, we talked about going one full year (spawning yet another name for the event: Free Year). Given that and doing the math: $500.00 - $999.99 every day for 365 days yields a total giveaway ranging from $182,500.00 to $364,996.35. Most likely we'd land somewhere north of $200k. Every Day Is Free Day was shut down on its 40th day (December 18, having started November 9th). What happened? Before diving into the early shutdown, it's time for a disclaimer: I'm not a lawyer. Nobody at SparkFun is. Like many companies our size we do have a lawyer on retainer, but sweepstakes are not his area of expertise. Regardless, only after Free Year was up and running did the word sweepstakes pop up and prompt the question: Is Free Day completely legal? In retrospect, this is a question that should always be fully explored before launching into a thing, but Free Day never carried a seed of doubt before. This time it did. So everyone began digging. It was around the time that we were really learning a thing or two about US lottery law that I decided to have Free Whatever the Days It's Called shut down. We had yet to advertise or even announce the event. It was clear, however, that doubt had clouded the event, and none of the many ideas put forth to spin it in different ways were adding clarity. Just to be safe: off it went. Prize and chance are straightforward: winnings and randomness. Consideration is more nuanced. It's basically the barrier-to-entry. A contest in the form of a sweepstakes neutralizes consideration, resulting in a prize offered and awarded by random chance with no barrier-to-entry. We've all heard the phrase "No Purchase Necessary," and that's a telltale sign of your standard sweepstakes; you can enter by buying something, or by a simple, free means of entry. Officially, this is called an Alternate Means of Entry (AMOE). All the best sweepstakes have them. Free Day didn't appear to have an AMOE. Did it need one? I don't really know for sure; I'm not a lawyer. We could add one, I suppose... but how would that change the game? How easy does it have to be? The only hard-and-fast rule about AMOEs I could find is this: The odds of winning by purchase should not exceed the odds of winning by AMOE. I welcome you, dear reader, to calculate the odds of the contest as described and try to construct your own AMOE to make it work. As you'll likely find, things begin to look very different very quickly. Don't forget to put yourself in the shoes of a computer-savvy hacker type looking to milk the system for all it's worth! Now then, knowing what we know now, what of Free Days past? Were they all fair and square under these rules? I would argue that Free Day Classic was fair because chance was effectively eliminated. Consideration was certainly present, as purchase was required for the prize of a free order, but given that anyone who got their order through got the prize, any chance was left to elements beyond our control, such as latency to our servers from wherever an entrant lived. But maybe that is still chance. Oy. Free Day II - the year of the quiz - well, again the chance-neutral argument could be made because there was no drawing of any kind. First folks through got the prizes. Consideration was considerably less as well, since all purchasing was removed from the contest. But consideration can be more than money, because time also has value, and time spent answering quiz questions can potentially be a barrier-to-entry worthy of being considered consideration. Free Day III was hallmarked by the truest random chance ever in the form of an elaborate Geiger counter setup. Players could enter as many times as they liked by entering a Captcha and clicking a button. It was by far our lowest barrier-to-entry and was uniform for all players, so I think here we can make the strongest case for appropriately neutralizing consideration. But would that stand up under true legal scrutiny? Let's hope we don't have to find out. So were the past three Free Days all legit? Probably. Lottery law is, however, not cut and dry. Over the forty days that Free Year was able to run we gave away $21,536.53 to 153 customers in 15 countries. Though most were in the US, some winners were from as far away as New Zealand and Nigeria. 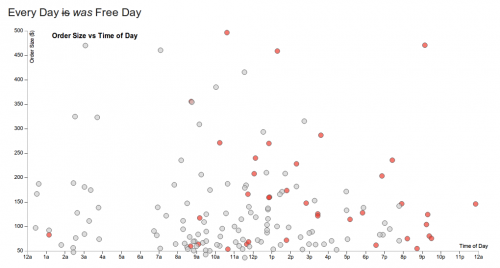 As all Free Days are a trove of fun data to visualize, here's Free Year at a glance. 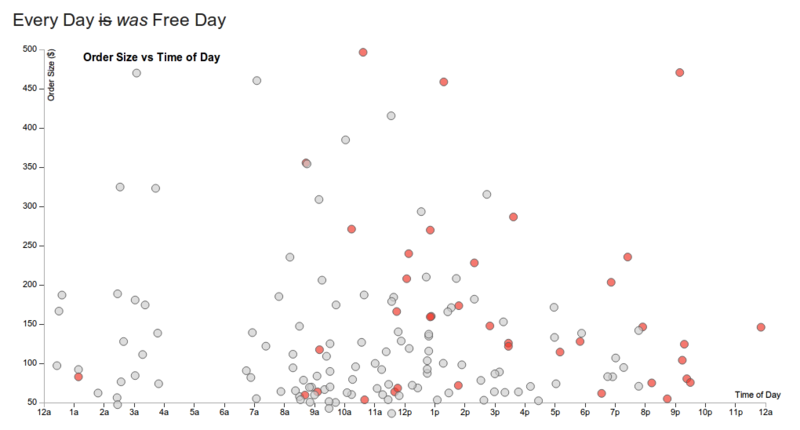 The red dots signify final orders for a given day. Officially, no. Free Days take a lot of energy and resources to put on. Especially given what we know now, a future Free Day should be free of any legal doubt, and that takes doing some homework. There are too many other moving pieces to dive back into that gauntlet just now. In light of these events, SparkFun may be a tad gun-shy about games like Free Day in the future. We're not a tiny company operating out of a closet anymore, and we've been targeted by legal proceedings in the past. Out of self preservation we need to be careful and diligent. Now, that's to say nothing of the many irons in the fire that will also make the average SparkFun customer a happier camper. Things like broader [same-day shipping](https://www.sparkfun.com/static/customer_service#Same-Day Shipping), bringing back free shipping in some form, and a full-on customer appreciation program are all on the horizon, along with continually improving content like tutorials, projects, and tear-downs. We can do those freely out of love for you, the community, without getting all nervous about legal murkiness. As head of the development team at SparkFun I can also tell you those are way more fun and rewarding to work on than Free Days (which tend to be grueling slogs). One of those other moving pieces happened to be the SparkFun National Tour KickStarter Campaign. It was an ambitious project to crowd-fund $150,000 to teach 50 Intro to Arduino workshops to teachers in schools across the US, leaving behind 50 SparkFun Inventor's Kit Lab Packs for years of students to learn electronics. Many contributed, but ultimately the campaign failed to reach its goal. The community spoke: If we really want to do this, we had better fund it ourselves. So, no grand announcements yet, but we will be touring in 2013, using those same Free Day funds to invest in schools around the country and beyond. Running the KickStarter campaign was an illuminating experience. In the process, we were able to reach interested tinkerers we had never reached before. Connections have been forged with previously unknown schools and libraries who are excited and passionate about what we can do together. Canada - my goodness Canada - a country so progressive in electronics education, answered our call but were de facto excluded since it was to be a US tour. Now, free of self-imposed restrictions, we can get there in 2013. I'll leave the rest to our growing Department of Education to expound upon as details gel. Suffice it to say, this turn of events has been strange and at times unnerving, but 2013 looks incredibly bright. Although I'm a little sad I won't be sitting in front of the computer frantically hitting F5 or deciphering captchas for hours on end, I think investing the Free Day funds in education is an awesome idea. absolutely. Invest in education. the rest of us will find the money to buy stuff. You're right. Last year I spent about $100 and got $200 worth of awesome stuff. This year I only got $100 worth of stuff. When I can afford it, I will shop somewhere else. I've been a customer for 3 years, written libraries for Sparkfun products, and spent about $2k on gear from you guys and I'd be very happy if you took the prize money and spent it on education programs instead. I'm very passionate about education (see www.sciencebrothers.org) and belive it's a very worthy cause. Classes are a good start but have you considered a grant program? Let schools/programs apply for 'grants' in education kits, etc? This whole thing is a sad statement, but an accurate representation of what our well-meaning lawyers and legislators have done to this country - A company can't even give away stuff without being regulated to death or threatened with lawsuits. As one of 5 founders of a company which at it's peak employed 35 people until it was put out of business largely by a frivolous lawsuit that cost about $300k to defend (not to mention the distractions on our management and employees) I understand what you're going through and trying to avoid. As a customer of Sparkfun, I appreciate the openness, as others have stated, and I'm not looking for anything FREE (even though everyone loves presents!) so my first concern is that you dont get bogged down in any inefficiency (lawsuit or other) that would prevent you from continuing to offer the coolest products at the best prices you can. Running an efficient, customer friendly web storefront should be the first priority.. Your experience with lawsuits and this federal lottery law case are entirely different. One is a private lawsuit brought on by other parties, another is an avoidable problem by simply ensuring that you work within the law. There are good reasons for the lottery law. The most important is: if a purchase is required to increase your odds, it falls into the domain of gambling, rather than a pure contest. Only states can authorize such lotteries. Correct, its whether or not its an illegal lottery or a true sweepstakes. Though a contest is another matter and would involve some skill. Which I think some Free Days were, but I've only taken one business law class so what do I know :-). People have held what looks like a lottery to sell their house, but they add something like a essay contest and call the money an entry fee. Just want to say "Thank You!" for all of the past Free Days. You are very welcome! Thanks for reading and keeping up with past Free Days. Same here! Thanks a bunch SFE! Quite honestly, I didn't even know that spark fun was doing a free day every day. From my own experience trying to run a sweepstakes I can understand the legal gray area that unique giveaways impose. So, I respect your decision and appreciate the transparency that was shown by posting this. Our intent was to run the daily give away without announcing it for awhile, as a sort of quiet 'thank you'. So it's a bit odd for us to announce the shutting down before really fully announcing the program but we wanted to let folks know what was up and what we learned. Had I known that I had a chance of getting my order free, I would have purchased my wish list that I have been waiting for a good reason to add it to my cart. I also don't think it can be "Free Day 2013" as it started and ended in 2012. Like Skyler said, we appreciate the transparency. It sets SparkFun apart from everyone else. Thanks! It's another one of those lessons that we never learned in college. Who knew we needed to take sweepstakes law? Having been a winner in two past free days, and spending a great deal of time in my "real" job on promotions and marketing that have to deal with lottery laws, I am sad to see it go, and completely understand why it had to. Let me say that I am glad to see you re-allocate the money to your educational tour. I did not contribute to the Kickstarter campaign because I think that those who contribute to a campaign should also be the beneficiaries, however I love the idea that you would take profits and utilize them in this way. Well, I don't think this free 'day' can really be called Free Day 2013, considering it never actually made it into 2013. Instead, I think an appropriate name for this small Free Dayish trial should be simply called "Free Day 2012 Part 2". Personally not sad to see it go. Too much PIA Factor for me. On the bright side, I'm VERY happy to see more educational events come to Canada!!!!!! Woohoo!!!! Come grab some Tim Horton's coffee, some donuts, and maybe some beaver tails; and we'll Arduino a new hockey score board built from Spark fun parts and Canadian Tire stuff. Or maybe we'll make a Touque that conviently displays the outdoor temperature (in Â°C). haha Come on up and I'll buy the 24 ! This allows for a 'no purchase necessary' option. Since the prize is equal to the value of the order, if someone submits an order for $0 and they are randomly chosen, they win a lovely message saying their order of $0 is on the house. I won in 2011 and 2012. I was like a kid on Christmas. The funds didn't last long but I was able to justify getting thigs that I might have passed up due to price. That being said, I will join those saying that as much as I would like to win again, I would rather see the money go to the tour! It's a shame it didn't work out, but putting the money towards the National Tour is a worthy replacement, for now anyway. I'm sure the staff will enjoy their (working) holiday. I wasn't well last year so didn't do the entire capacha hell thing, but I have to say 2011's quiz was fun and did a good job of filtering out the leaches. Not to mention the quiz made it a game of skill rather than just a game of chance which solves the Lottery Law problems around the world, not just in the US. No matter what I love sparkfun. No purchase necessary seems great except the prize is a free order which you have to purchase. Keep making cool stuff. Free Day II was definitely the best one you have done, as it required some sort of initiative from the buyer. Free day classic I didnt even know your site existed ( :( ), and, well, Free Day III was a bust. Just too much randomness. Free Day IV one i also believe to be a bit of a failure. It wasnt so much of a "free day" rather than a free month, and, truth be told, announcing it would have generated lots more sales (ya know, which wouldnt be bad... ). But I guess its better to be out of that "grey" area in the law. The thing is, free day is not about AMOEs. Its not a sweepstakes, its not a lottery. Its a combination of the two, and thats where you get most of your legal "grey area". Plus, as a company serving internationally, you must somehow make the contest availible to hundreds of thousands of people across 24 time zones. Really??? That captcha did not want you to win! About every bottle of soda I open has some code that can be used to win something. Why couldn't Free Day take some form like that? Include a entry code on every packing slip that gets sent out. Just like the soda companies, your AMOE could be an address to write to/webpage visit to receive a free code. Limit entries to 1 per week (or other time period), and give away product/store credit. As an ongoing contest you could easily control how much is given away so you can invest remaining money into the National Tour. I think the reason they might be against this, is that it requires a purchase, and that's one of the reasons they stopped this. All the soda companies, if you read there rules, have an address to write to in order to receive a free game piece, instead of buying a soda. Coke/Pepsi have been doing that since I was a kid so I can only assume its legal. Interesting.......But they do have a "no purchase necessary" label, right? Yes, the "no purchase" part is what makes it legal. You can provide game codes with a purchase, you just have to provide the AMOE like they mention in the post.
" ... NO PURCHASE NECESSARY TO ENTER OR WIN. A PURCHASE WILL NOT INCREASE YOUR CHANCE TO WIN. INTERNET ACCESS AND REGISTRATION REQUIRED. VOID WHERE PROHIBITED. ..."
"... WHERE TO FIND CODES: Look for a unique ten (10)-character alphanumeric code (each, a "Code") underneath orange bottle caps on specially-marked 20 oz. bottles of Mountain Dew products, ... "
" ... NO PURCHASE NECESSARY: To receive one (1) free game piece and a copy of these Official Rules, while supplies last, send your name and complete address postmarked on or before January 16, 2013 to: DewXP Promotion, PO Box 760012, El Paso, TX 88576-0012. Limit one (1) free game piece request per hand-addressed stamped outer envelope...."
Thanks for the thought-out suggestion. This somewhat illustrates one of the underlying issues of Free Days - complexity. The simpler the program the better, not only to execute it but to understand what you're executing. In learning all I could about this aspect of the law I spent a fair bit of time just reading official rules like that. Most of them are opaque walls of text and quite dry. Not fun. Free shipping on Cyber Monday, by comparison, was done in about thirty lines of code and could be described in a sentence. The complexity to benefit ratio on that is staggeringly lopsided in a very good way. A game-piece-code system with an equally-matched AMOE and a weekly drawing would require plenty of overhead to pull it off. It's certainly doable... but is it worth the effort? Another point to consider is originality. Our experimental nature got us into this situation, after all. One of the crowning points of Free Days past is that they are all quite unique. A future sweepstakes, complete with legalese-hardened rules and a fair AMOE, would need to also bring some really inspired twist to get folks excited about putting it on. I think that you could provide an adequate AMOE using the Wish List system. A user adding an item to a Wish List that pushes it into the qualifying range triggers the random number generator for the chance to win all the items on the list. Each list gets one trigger or one trigger per list per day (whichever is most legal). Sure you'll get some people creating wish lists just for a shot at free stuff but probably no more than you'll get people cancelling orders after they fail to score a freebie. Maybe a code on the packing slip, and a code if you email an address with a verification of your SF account? Thanks for the post, this level of transparency is awesome and provides a valuable lesson to those of us in big tech businesses. I hope you find a way to maintain it as you continue to grow. As for Free Day, will I miss it? Nope. I have never had the time to be able to participate. I put my SparkFun orders in typically when I need stuff and do not have the time to sit and do the refresh and enter a CAPTCHA thing this year. In fact being transparent I felt like this years competition was excessively biased towards people who had time on their hands. Woot actually ran into this same problem a couple years ago when they tried to change up how they gave out their famous 'bags o' crap' so that they weren't so biased towards people gaming the system. Their initial way of doing it was to put up a completely different item for sale, a set of Woot-off Lights. Everyone who bought them was technically entered. At the closing of the stock market that day, they took the last digit from the NASDAQ index, and every order number that ended in that digit got a BoC. They found themselves in the same legal quagmire of 'is this a lottery, is this a free-gift-with-purchase, is it something else?' Needless to say they never tried doing it like that again, it was just too risky. I actually think your frist Free-day was the most question-free on its legality. It was no different than any store that offers a limited time sale, or limited supply sale, which they do all the time, and without needing huge amounts of fine-print. Even the Quiz one might have been ok. But I definitely agree that this method, and the geiger-counter one from last year, are bordering way, WAAY too close to lottery for you not to have every legal avenue covered. Anyone who is buying from SparkFun already has enough knowledge to make as much money as he or she wants. So use the money to educate kids up to the point that they can order stuff from SparkFun and know what to do with it. At that point, they don't need any more help. Bummer. I thought we were just getting randomly paid for slamming the servers! I love Sparkfun because of it's creativity. Sadly, criminals are also creative and trying to keep them from screwing people, we take the fun out of business. Keep up the good work and don't let it become just Spark without any Fun! Seems like someone did not win. Why would this even come up? I order my stuff all the time, and the free day thing is a great bonus. Why does everything that is good have to be clobbered by someone else? I guess they are not MAKERS, CREATORS, they ride off the coattails of others. If they dont get what they want, they spend there energy on this type of crap, instead of CREATING, INVENTING. Why are they even on this site? Lawyers will be the death of this great nation. Wouldn't that definition of lottery make the stock market a lottery? Stocks, like any other investment also include "Risk" which is not an applicable concept to the topic here. In a sweeptstakes if you "loose" you simply "did not win" instead of "lost my fraking savings and now big brother will take my house and sell my wife, and my kids will make low cost shoes in vietnam"
Well, I've tried twice to get in on the free days in the past and have been blocked by the huge flood of network traffic both times so I'm not too upset about the loss of free day. I'd rather see something more like a frequent buyer rewards program or a 'cash back' rewards program. Glad to see this going away. Nothing like treating your customers like guinea pigs. Don't know about the rest of your rabid fans, but that was below me. You sir, have obviously not lived the life of a starving (well, not starving...) student. When you have no cash at all to work on something you love, you'll have no trouble spending a few crazed hours one day a year, just for a chance to build that one thing that you don't have the money for. And really, guinea pigs? This was not a science experiment last time I checked (apart from server load tests). Anyone at sparkfun have anything to say? Maybe Nate decided he needed to spend $150k just to see what people would do for a chance at $100? Why would anyone do that when they can just look at people and Powerball lotteries.... Plus, you know, if it was below you you actually had a choice in the matter to participate or not. I don't participate in bidding on ebay, I only go for buy it now deals. Offering a chance to win 100$? Would of been nice if it actually worked! More like being lucky if you could stay connected to the server!! And honestly, could you have predicted the 300,000 people trying to access one page on a server all at the same time? Thats why they ran server load tests. To make sure that next time they could handle it. To you, its just a nice little $100 bonus, but to someone else thats a stepping stone into the world of hobby electronics. Sparkfun's free day is part of the reason I am even thinking of getting a degree en electrical engineering, along with MAKE: and adafruit. It is no surprise to me that 300,000 people would be trying to connect, like I said, I don't like being used as a guinea pig by a company that is wanting my business, and my hard earned money! And 100$ is the difference between you deciding to be an electrical engineer vs who knows what? Really? Your the perfect guinea pig. aww this makes me sad, but i can understand. thank you for putting the money to good use though. though in the past events you always seem to find the days where i could not enter due to work. i was hoping for some good news near my B-day but alas no luck again. So I guess when Visa gives away a credit card transaction (as they OFTEN advertise and state one has the CHANCE to get their purchase free during certain promotions), they are a bigger enterprise and therefore immune to these same "lottery" laws that lawyers will often target smaller companies because someone didn't get their "free day" and had to pay for their Sparkfun breadboard when they thought it should have been FREE. Maybe Sparkfun should give a "Discount Day" and offer a 10 or 15 percent discount for purchases and call it "Celebrating Free Day's of the Past." I know that way EVERYONE would win and I know personally it would be a great incentive to buy more on that day even if one didn't really need the purchase. Who can resist a SALE! Indeed, as Frencil points out there is an 'official rules' document that is about 20 pages long that goes with every one of those contests. And actually yes, very often in them there is an AMOE that allows you to win some kind of prize. Visa has a very large legal team that specializes in making sure the rules comply with regulations in every state (and yes, they vary per-state). It's unfortunate that Sparkfun has gotten to the size where bureaucracy starts to creep into the business in places that aren't expected, but it's a natural part of growing larger. I'm glad they're focusing on putting the energies that would have been wasted trying to sort this mess out into other more productive ones. Hopefully you guys can continue to keep the fun, entrepreneurial spirit of just doing things because they're cool even as you continue to grow. In researching other sweepstakes that were morphologically similar to our Free Day (to see how they did it) it was clear that a thick text-wall of official contest rules, likely presided over by lawyers at great cost, was required. Visa is not immune from these laws but they do have the coffers to employ teams of lawyers to ensure their contests are iron-clad. We're used to running Free Days like this: ideas get tossed around by folks who are distinctly not lawyers. Ultimately we settle on a rough idea and then the development team cranks on that to figure out how to do it in code. As the devs solidify the actual game mechanics our marketing team comes up with promotional material while our production and inventory teams ramp up stock to ride the expected wave of volume. Nowhere in that mix is a lawyer to write up official rules because there's never needed to be. Personally, if it looks like a lawyer or lawyers will be required from now on for just such a thing, I'd rather continue to focus energy on similarly big impactful things that we can do ourselves with the people we have (in the DIY spirit). I'm just glad that we have a government to protect us from corporations who are offering us fun. God forbid we should have fun. Lawyers take the fun out of everything. So.. maybe just offer repeat customers a little discount the way thousands of other companies do? Keeping existing customers happy is a cornerstone of most smart business owners. Did that go out of fashion in favor of lotteries? The cynic in me finds it a strange coincidence that when the hyped up Kickstarter Tour failed, the very un-hyped Free Day ended and all funds were diverted to the Tour. We certainly didn't plan for that but they did line up nicely. November was a very stressful month between launching Free Day, launching the KickStarter campaign, and executing a Cyber Monday event all on top of the usual madness. By mid-December, as the KickStarter was looking more certain in its fate, and the legal murkiness was enveloping Free Day, it was only natural to draw a connection between the two for the benefit of our customers, our educators, and ourselves. So while yes, it is a coincidence in that the two coincided, it was definitely not planned out this way. Quite the opposite, in fact: our plan was for a successful KickStarter and a full year of Free Day 2013. Believe me, I would've supported you in the kickstarter. Unfortunately, being a student with no time or place to even think about a job, well, more electronics arent my #1 priority (right now its God and good grades). I totally wish they were sometimes my #1 priority though!!! This leaked out a while ago on the RSS feed and sparked quite a conversation on IRC! In the end, it turned out exactly as I thought it would (being cancelled and funneling the money to a tour). Funding the tour seems to keep with a lot of the reasons for doing Free Day in the first place (giving back to the community, providing hardware to those who can't afford it without a PITA grant process, etc.) You don't get the bonus stress test of your site, but I'd argue that building the infrastructure to support Free Day is overkill. 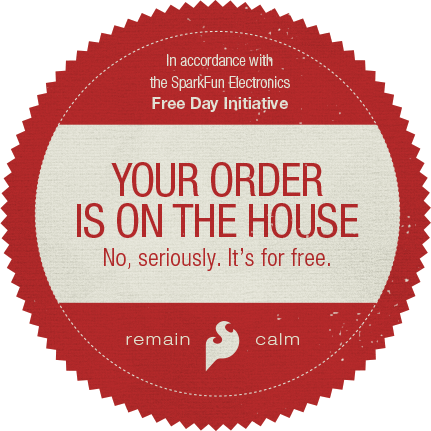 The original Free Day also generated a lot of attention for Sparkfun (including trending on Google and Twitter), but with diminishing returns over the years. Basically, I'm happy the way this turned out. Darn! I was looking forward to free day this year as it would be my first one. We actually DID make you purchase something in the new version, and that is the reason we had to pull back. No, No you did not make me buy anything. I was going to make the purchase independent of the contest because the contest was not advertised and I knew nothing about it. The purpose of a sweepstakes or lottery is to increase sales, so it has to be advertised to work. The law makes the assumption that these contests will be advertised; but as usual Sparkfun went outside the box and ended up in uncharted territory. I also contend that past Free Days were not lotteries. Rather, they were ad hoc load test programs for the SFE server systems. This type of thing has been employed many times by many companies in the past to help debug their software and systems. People didn't just enter a contest and wait, they spent hours hammering away, causing crashes, and ultimately providing useful information to SFE that would have cost money to get any other way. Being the rouge company SFE is, it operates in a gray area where the laws are subject to interpretation. But I guess that means the Gieger Counter free day was legitimate and legal? Will there still be other contests(such as caption contests) still going on? Ah, sorry missed that. I was thinking about the Free Day concept, not the actual campaign, when I read it. Thanks! Good point, but as Erik said, you do need to purchase something. Also, you're just looking at state law. What about federal law? If I'm not mistaken, there should be a large section of this either in an amendment or some sort of federal law. Where I live, money actually has to change hands before it can be considered a lottery. If the chances free, it is not a lottery. I'm not a lawyer and have no idea how your state laws are considered, but if you give everyone a chance when they purchase to get their purchase free, "no money changes hands" in order to get this chance, then it should not be considered a lottery. The purchase amount on the product has not been changed in order to give the customer that chance. It is the normal price of the item. And if the window comes up stating you have received your purchase free before the payment screen comes up, then no financial payment would be requested. I.e. there is no fee aspect within this promotion. Is that what's going on in Canada, progressive electronic education? Just curious as I've been running into a large amount of Canadian projects lately, a large enough proportion to make me wonder what's going on up there. OK if the law won't allow a "free day" because it's a lottery not a sweepstakes, then how about another form of customer appreciation program such as an "at cost" sale. You could just sell stuff at dead cost, with free shipping until a dollar limit was reached. Is this a lottery? How is selling below cost a lottery? The cutoff point is when you are "sold out". In other words you have $200k of stuff to sell, and you are going to sell it below cost to 'get customers in the door'. Only one below cost item per customer until you are 'sold out'. The customer gets to choose which item it is. Selling at DEAD COST (or some fraction of dead cost) is a common practice used by brick and mortar sellers to get customers in the shop to buy something else. Brands-Mart, Crazy Eddie, etc (must be someone like that in your neck of the woods). Hopefully the state SF is in doesn't have a minimum markup law. A business in Wisconsin has to mark everything up by 6 or 9% above wholesale. Small gas stations in Milwaukee have a hard time with this. Uh, okay, I'm disappoint I guess. I was supposed to be disappointed, right? It is hard to be disappointed when you didn't even know what was going on. It is one less thing to look forward too in January 2013, but maybe the funds can go towards something better. The quiz freeday in 2011 was the best in my opinion. I couldn't handle the captchas last year and gave up early on, but it was still a bit of fun. In the future, my preference would be to use the funds just to have lower prices everyday. I hate the whole idea of going through hoops, staying up late, etc in order to get the special seasonal sales. Yeah, it does stink, but we had to make a decision one way or the other (whether to redo Free Day or use the money for something else), and no matter what we did, some people were going to end up disappointed. We'd love to make all our customers happy, obviously (both from a personal and a business standpoint). We're passionate about what we do and want everybody to share in the excitement, but we can't even always agree internally on what should be done, so it's obvious all our customers won't agree with us either. That said, I think most of us feel this made sense in terms of our values as a company (though please remember I'm just another SparkFun employee, not an official spokesperson). Hopefully we'll find some way to get you excited again in the future. Me thinks this was a bit over thought. Time as consideration? Can you point to a case? Obviously the big bad mean government is going to get in the way of a company giving away stuff IF there is shady companies out there that claim to give a random prize with purchase and either don't or give to select customers. A little thing called fraud. Give away stuff with no purchase requirement and I would love to hear the case where the big bad government said no. Government would not come into this. It would be lawyer who saw an opportunity for a class action lawsuit. For instance, I placed an order in this time period, but my order was for $46. Why was I excluded from even participating ? It's this stuff that lawyers eat up ! Precisely. And in lieu of hiring a team of lawyers to protect ourselves from other lawyers we don't want to leave ourselves so exposed to just those opportunistic over-thinking litigators that would bring the hurt on us. In my opinion, the penny auction places are complete fraud, and they seem to be getting away with it somehow. But, you have a valid point: is it a lottery if no one knows about it. Or, giving away free stuff is okay, but only if everyone knows before the purchase that they are getting the stuff for free. If you have to give money to find out, it is really the same as buying a lottery ticket. 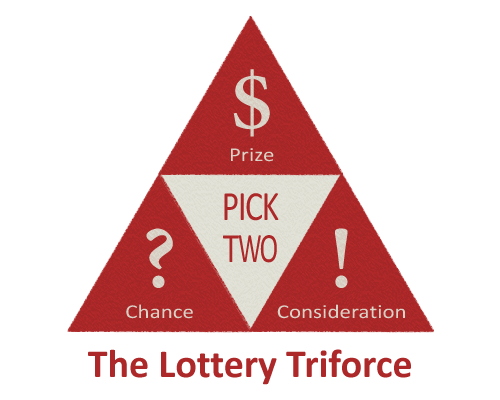 Figure out a way to tell the customer before they complete the purchase and it is not a lottery. But that completely changes things. Excellent idea, nate. instead of giving free stuff to people who are already involved, invest in education and make the community bigger. sparkfun is guess is half cult half company. Wait, so didn't this... Whatever it is have a prize and consideration, but no chance? There's no randomness, if a person were to simply buy $501 right after midnight, it would be free for certain. Am I right? Nope... first of all, the order total had to be between $50 and $500, so a $501 order wouldn't win anything. If you placed an order with a total between those two numbers right after midnight, you'd have a CHANCE to get it all for free. I don't remember the exact randomization that was used, but if you're curious, I'm sure Dave could answer the question, as he wrote the code. Damn, just yesterday I was wondering when the next free day was going to happen. Oh well.. The growing up of a company, "Weâre not a tiny company operating out of a closet anymore" . Next, time to start buying up the competition. adafruit ............. watch out for a hostile takeover ! Unknown. A lot's going to happen between now and this time next year. The likelihood of seeing free shipping come back in some form or another next year is favorable because customers loved it and in many ways it was an order of magnitude easier than a Free Day to pull off. When 2014 starts approaching we may begin talking about Free Day again, but what will come of that is impossible to foresee this far out. alright, glad to hear it's not officially gone for good. Maybe try something different rather than free day....I don't know. But either way, don't lose the usual SFE spirit! I haven't even fully thought of that, but that sounds like an amazing idea!!! I'm all for it!